Water soluble cationic polymer. High cationic charge density in ready to use aqueous solution form. 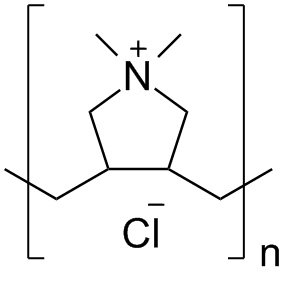 Material is quaternized cyclic amine supplied as the quarternary amine chloride. The ability to modify surfaces and provide cationic character allows the user to selectively attract negatively charged functional groups to the coated surface or to the dissolved water soluble cationic polymers. polymer bridging to link functionalized polymer systems 28% Solids in water Available in several molecular weight ranges. If other molecular weights are required, please call us for a custom quotation.